Yesterday I swam with dolphins. Tons and tons of dolphins. In the wild. It was incredible! Our morning began around 7:30 a.m. when we were picked up at our hotel and driven to the Waianae coast to board a catamaran with a small group of other people from the press trip. 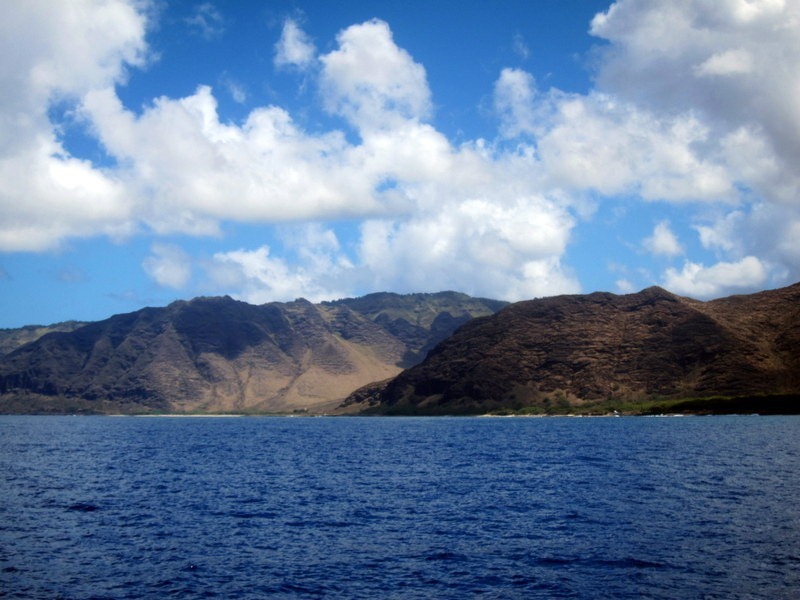 The Waianae coast of Oahu is gorgeous and the beautiful beaches are nearly deserted since most tourists tend to hang out in Waikiki or the North Shore of Oahu. It felt like we were discovering a hidden secret! Our group included about 10 people and felt small and intimate. Wild Side Specialty Tours intentionally limits the size of their snorkel tours and focuses on ecologically friendly and nature-minded tours. Along with the boat captain, Wild Side Specialty Tours had two marine biologists on board which added so much to the experience. Guests on the tour could speak to the marine biologists and ask them questions or simply kick back and enjoy the sun in between snorkel stops. You better believe I took full advantage of the marine biologists’ knowledge and chatted with one of the biologists for more than an hour. I find dolphins so incredibly fascinating and learned a lot. Did you know that many experts believe that dolphins can commit suicide? I had no idea and found the thought both sad and interesting. The tour itself took guests around the ocean in search of pods of dolphins. In Florida, when we see dolphins in the Gulf of Mexico, we’ll usually see three to four dolphins. On this tour, we saw pods with 20 to 50 spinner dolphins. It was unreal. We even saw three baby dolphins! They were so tiny and absolutely adorable when they’d clumsily pop up for a breath of air. When the catamaran came upon a pod of dolphins, the biologists would discuss whether or not they appeared relaxed and if the pod appeared approachable, the biologists would coach our group on proper snorkeling techniques to make sure we could float in the water with them without disturbing them. We were able to swim with three different pods. Looking down in the water and seeing 20 beautiful spinner dolphins swimming below me in their natural environment was indescribable. I will never, ever forget it. 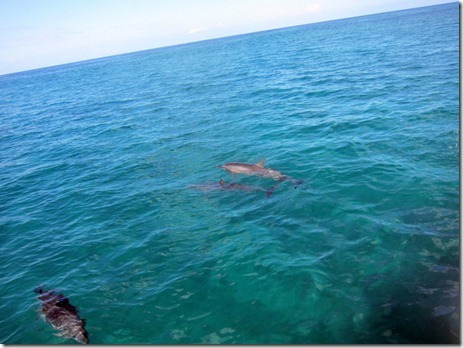 Once we were done swimming with the dolphins, we ate lunch aboard the boat and cruised around to snorkel at a reef. During our time aboard the catamaran we saw four sea turtles which was really, really neat. It was an unforgettable day and Ryan and I cannot stop talking about it! Thank you so much to Wild Side Specialty Tours for such a special experience. Julie, you’re so silly! You always hide behind Ryan in bikini pictures 😉 flaunt what you got, woman! Also – I’ve always wanted to swim with dolphins. I had the huge honor of swimming with nurse sharks and manatees in the Keys, but dolphins would be epic! Your bikini is super cute! I’ve always wanted to swim with dolphins. It sounds like you had a lot of fun! I wish I could do more vacations with scientists/experts about the natural things around me. Maybe they have tours for that. Swimming with dolphins in their natural habitat is my absolute dream! Dolphins are so amazing! Okay, wow! I was a marine biology major in college and I have to say I am SUPER JEALOUS! How awesome! I’ve swam with dolphins before but only in captivity. I am so jealous! Dolphins are so cool and the water looks perfect! What an amazing experience!! And out in the wild?! Definitely the experience of a lifetime! That would be such an amazing experience! I know a lot of places have swimming with dolphins in an enclosed environment, but to do it in the wild would be incredible. P.S. you look super cute in your bikini! Ohhh this is an activity on my bucket list for sure! I can only imagine what a fun experience that was. wow, this sounds soooooo great!! I cannot believe how animal friendly this tour is- it is amazing!! I think it makes SUCH a difference to see in their true natural environment. Really happy that you guys have such a great time. The program seems outstanding. Sounds amazing! I love dolphins too! In fact as a bio major, I did one of my senor papers on a particular species. They are amazing creatures, that’s awesome you guys got to have that experience. So much fun! Love the ruffle bikini=Hottt! That sounds so amazing! We went scuba diving with dolphins on our honeymoon in Honduras and it was so incredible. Your trip looks so fun! Julie- long time reader but 1st time commenter. Love your blog! Especially Sadie 🙂 Not sure if you’ve heard of the documentary “The Cove” – um, it’s really imformative but incredibly sad. Anyways – I’m so glad you you were able to swim with dolphins in their natural habitat. After watching the documentary you’d understand. I won’t get into all the gritty details here on your fun blog but Rick Barry who is a huge advocate for freeing captive dolphins used to be a dolphin trainer and actually trained Flipper (yea, from TV!). In the documentary Rick talks about how Flipper actually committed suicide right in his arms. Really sad but as you said.. interesting fact. Not sure I’d recommend the documentary to a fellow animal lover because it’s really depressing. I feel kinda weird posting for the 1st time about dolphin suicide. Ummm… I’m generally a cheerful person. 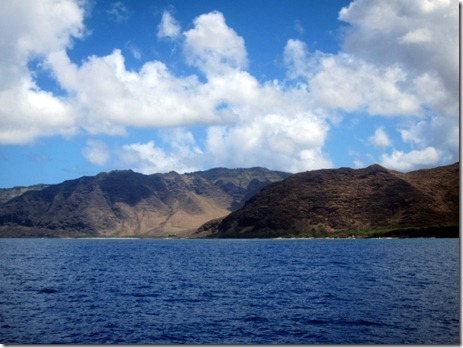 Anyhoo….SO jealous you’re in Hawaii! I’m going next year.. can’t wait! I was just about to say the same thing about Rick Barry and Flipper! Watched The Cove as well, and will never, ever participate in anything like swimming with (captured) dolphins, Sea World, etc. Wow! this looks amazing!! I’m definitely jealous, swimming with dolphins has always been a dream of mine!! All of these Hawaii posts are definitely making me want to make a trip out there! It was never really on my list of places to visit, but it definitely is now! Thank!! Okay, I am seriously jealous of your vacation! SO COOL! I would absolutely love to swim dolphins, it just seems so cool! Like many other people already said, swimming with dolphins is something I would love to do! It’s even more awesome that you got to do so in such a cool setting! Soo jealous! I love dolphins! I have swam with them at a place before but not in the wild so awesome! Such a cute bathing suit! Where did you get it? How amazing you got to swim with dolphins in their natural habitat! What a once in a lifetime experience! What an amazing day you had! It is definitely wonderful to see wildlife in their natural environment. How were the biologists able to tell if the pods appeared relaxed and approachable? Incredible!!! Swimming with dolphins is most definitely on my “to do” list!! That looks like so much fun. I adore you’re swimsuit! 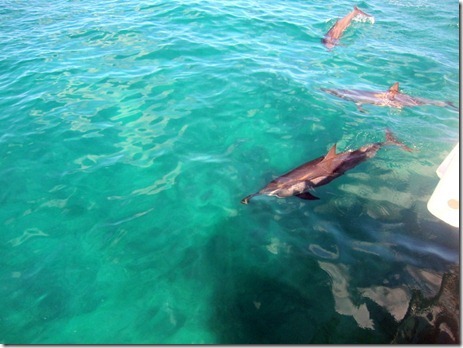 Oh my gosh…you swam with WILD dolphins! That’s incredible! I didn’t even know you could do that…so cool! Wow! What a once in a lifetime experience! Very lucky 🙂 I would absolutely LOVE to do that- but I’d also be worried about sharks..hahah yes I am a worrier! You have so many cute suits! I have always wanted to swim with the dolphins. It looks so amazing! Lucky girl! When our family went to Clearwater a couple months ago we did a dolphin tour boat where they scout out dolphins that will jump in the wake of the boat. They totally did and that in itself was amazing, I can only imagine how incredible it was to SWIM with them and in such clear water! How fun and special!! So fun! I went snorkeling when I was there.. the water is sooooo clear! Love your bikini! Your life is so cool!! Oh my gosh, out of everything you’ve blogged about related to this trip so far, this is BY FAR the thing I’m most jealous about. I’d love to swim with dolphins in any capacity, but to swim with them in the wild?!?! SO! COOL! You’re a lucky girl! Hands down, that is my favorite thing from your entire trip! I’d LOVE to swim with wild dolphins! So fantastic to swim in the wild, and with so many of them! 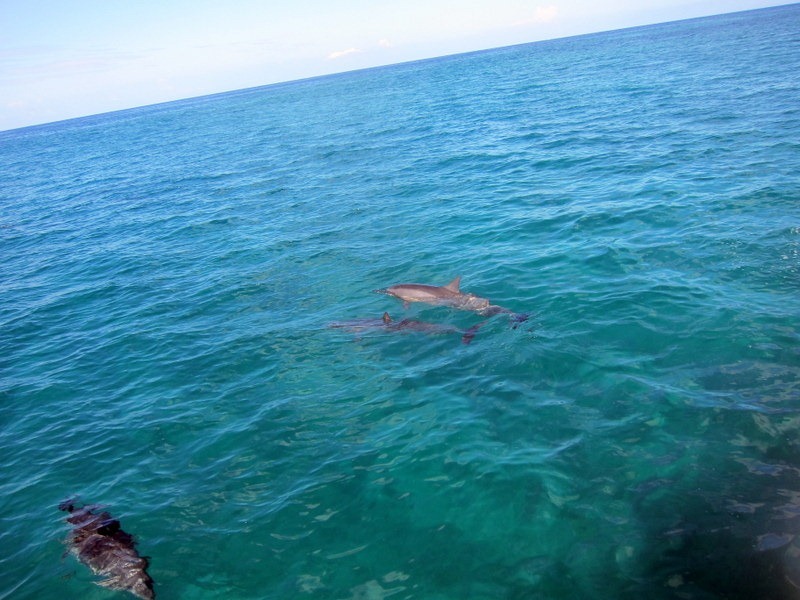 I made a few dolphin friends myself in Jamaica, but it was much more of a “tourist attraction” with trained dolphins…still amazing tho and I’d recommend it to anyone! Waianae beaches aren’t deserted because the tourists are in Waikiki. They’re deserted because it’s the part of the island where the lowest income people live, and it’s not a safe area to go to unless you’re from there. Leaving your car in the parking lot while you lay on the beach is pretty much a guarantee of returning to a broken window and everything stolen from inside. It’s not all rainbows and sunshine here in Hawaii, we have our problems as well. Thanks Lexi! For perpetuating the negative west side ‘image’ and keep the beaches accessible for those of us who know what a hidden gem it truly is. As with anywhere on vacation, a rental car is a “marked car” and leaving valuables inside sets you as a target. Travel safe = travel smart; keep your valuables safe wherever you go… Beaches are deserted because we are not on the mainstream circle-island route (the hwy doesnt actually go around the whole island, but cuts down the middle), similar to Hana on Maui – so Julie is correct in the ‘hidden secret”… and thanks Julie for such an insightful and motivating article!